Should U.S. taxpayers be paying to rebuild New Orleans? Hurricanes, tornadoes, floods and earthquakes are taking their toll not only on the U.S. infrastructure but also on the U.S. taxpayer. Landslides are powerful forces of destruction that California's unique climate and geology help promote. Politics are vying with technology in a new international project to interconnect observations of weather and climate. An imaging tool can look belowground to reveal how past storms shaped the coastal environment over time. Tornadoes are complex beasts that require advanced modeling to predict. An innovative geology teaching program highlights the visual aptitude of deaf students. U.S. federal agencies are joining up to identify research that could help define decision-making on the international stage. As the United States faces the largest rebuilding project in its recent history, one scientist is gearing up on Capitol Hill. Travel books can be helpful guides when venturing into new lands. Nevado del Ruiz erupts, triggering a deadly series of mudflows that destroy Colombian towns. Rita was building up to a Category-5 hurricane when this image was captured on Sept. 21, with winds at 220 kilometers per hour (140 miles per hour). When it came ashore on Sept. 24, Rita was a Category-3 hurricane, and it wrought havoc on the Gulf Coast infrastructure, already weakened from Hurricane Katrina just weeks prior. 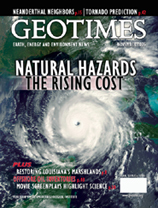 Read more about disaster costs, mitigation and management throughout this issue. Image by the MODIS Rapid Response Team, NASA Goddard Space Flight Center.